We each have our own special needs, tastes and degrees of willingness to use something we didn’t get for ourselves. That is why I cringe at the idea of having to write the mandatory Holiday Gift Column. After all, it is one thing to wear an ugly tie or bad sweater to work occasionally, but use a bad garden tool in the yard, ever? I don’t think so. However, if I don’t write at least one gift column, I am afraid someone will snitch on me and I will be run out of the profession. I could my lose my job. So this year, instead of writing about specific gifts, trying to get one that might please someone on your list, I write about a new category of “yardening” gift that you will be hearing more and more about, I am quite sure. That category is robotic lawn mowers. Really! This from the guy who loves to mow lawns. It is the stuff of dreams (and an occasional column), that is for sure. These machines of the future have come such a long way since those first models were tested in our yard back in 1996. 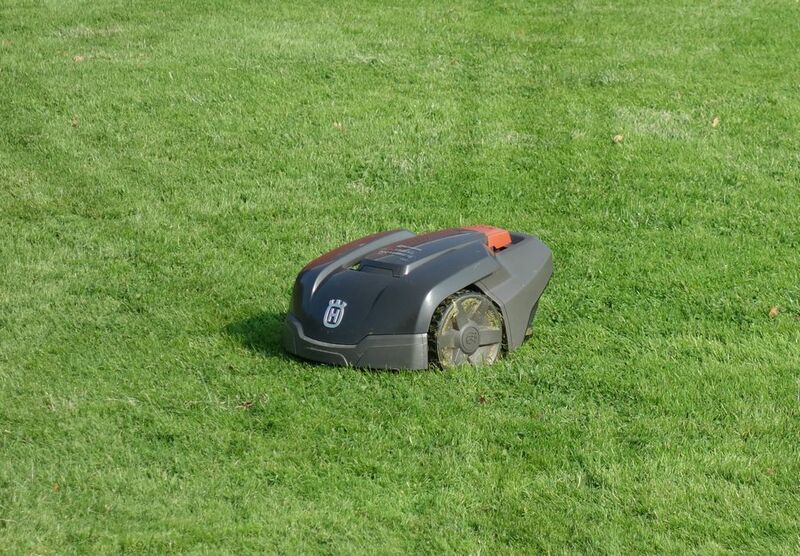 Robotic lawn mowers have come a very, very long way. In fact, I predict that within the next five to 10 years, robotic mowers will be the norm. So much the norm that many jurisdictions will ban the mowers we use today, which are way too dangerous and polluting and actually require too much work. Stuff of dreams? Well, if you are going to get a decent robotic mower today, you are going to have to spend in the vicinity of $1,000 minimum and can spend up to $4,000 or more. So, yes, dream. I don’t expect readers to run out and buy, but prices are dropping fast and in a few years, I am sure, they will be in the range of a good push mower and gift giving. Why would you want a robotic lawn mower? Well, the obvious reason is they mow for you. No effort. No gassing up. Nothing to pull (and pull and pull and pull). Nothing. Day and night, a robot will keep your yard in proper trim and never, not once, complain. The lawn never even grows long as it is constantly being cut. Robot mowers make very little or no noise. They are battery-operated, after all. They can work at night. They do not pollute, as they run off batteries. They do a better job cutting due to the different kinds of blades they can use, precisely because they are not an old-fashioned-style mower. There are now blade sizes to fit your lawn, larger blade-width machines for big yards and small ones for small yards. All you do is set up a bunch of guide wires, once, and let yours loose for the rest of the season. Some are now designed to handle up to 30 percent inclines, and they can handle contours on more level ones. Adjust the cutting height to suit your needs and the seasonal ones too. Some come with GPS, of course. Some have headlights, though I am not sure why. I saw at least one that will run its battery low, go back to its base, charge up for an hour or so and then go out and finish mowing. Crazy smart, these things. Computers at heart, after all and much better than a teenager, I hate to say. They have software that gets updated. What a world. Did I mention that there are models that can actually mow in the rain? Hmm, I wonder if any of them have a snowblower attachment like my Deere. Holiday Lights at the Alaska Botanical Garden: Through the 31st. Don’t miss 'em. And while you are there, join the garden, will you? For more light info: https://www.alaskabg.org/holiday-lights-2018.html. New Year’s Eve bash at the garden too: https://www.alaskabg.org/holiday-lights-2018.html. Indoor plants: Are yours getting enough water? Too much? Pay attention.